Chris Yates should need no introduction, as one of the finest angling writers in a generation and the author of one of the best-loved books on coarse fishing ever written, Casting at the Sun. 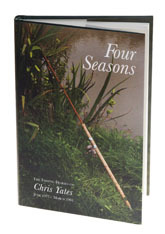 Four Seasons is a delightful work that capitalises on the diaries Chris kept in the seasons leading up to his capture of the then record carp in 1980. River Diaries can be regarded as the sequel and I can think of little better than to read the pair together beside the fire on a dark winter's night. Four Seasons begins in June 1977 and is the story of long sessions after great carp, all of this at a time before you could walk into a warehouse and take your pick of pre-packed baits from a supermarket-sized store full of state-of-the-art carp tackle. This adaptation from Chris' diaries brings this out extremely well and if the majority of modern carp anglers were sentenced to using the gear that Chris used to extract a 51 pounder from a not very large and particularly snag-ridden pond they would have nightmares for weeks to come. And yet, reading Four Seasons, there is no real sense that Chris is claiming bragging rights - it is just an account of how an obsession can sometimes lead to great things happening. There is also a clear message that his great catch was just a fish and that she was caught as part of the pure enjoyment of just being there, which is something that I don't think you could fail to absorb from reading this delightful book.